Rob Dehlinger is an exhilarating, charismatic trumpet player. 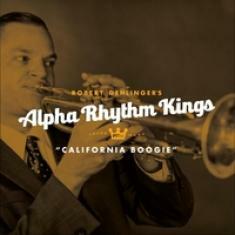 On California Boogie, the debut EP from Dehlinger's band, the Alpha Rhythm Kings, his intoxicating playing bursts with flying colors. He is also a dynamic front man, his singing brimming with blue-eyed soul. For a new group, Dehlinger alone makes the Alpha Rhythm Kings sound like seasoned veterans. They are a well-oiled machine, this band, and California Boogie explodes from the gate with their prime chops and roof-blowing enthusiasm. Dehlinger's seedy trumpet fuels "Oh Marie" with the kind of dangerous edge that conjures vivid images of drunken speakeasies. Snappy drums and throbbing bass add a robust kick as soaring saxophones provide a breathtaking uplift. Dehlinger's singing is magnetic. On "Something for Sellers," the band pays homage to comedic actor Peter Sellers, best known for his hilarious Pink Panther films, with a sprightly cha-cha. It has a groovy '60s vibe that lounge buffs will feast on. Revealing the Alpha Rhythm Kings' impressive versatility, "Boo Woo Woo" utilizes rollicking piano for infectious boogie-woogie. The Alpha Rhythm Kings strut towards the past to deliver a truly happening party record for the present.